The Christ in Prophecy Journal: How did the Gaza Conflict end? In response to over 6,000 rockets being fired into southern Israel by Hamas militants since 2005, Israel launched Operation Cast Lead in December 27, 2008, in an attempt to stop the rocket fire, make their southwestern border more secure, and cripple Hamas enough to end their barrage. A day before Barack Obama was sworn in as President of the United States, Israel ceased their air strikes and brought home their ground troops, signaling to the world that the conflict was over. In January's blog poll, "How will the Gaza Conflict end?," people's views were sought on how they believed the battle between Israel and Hamas-controlled Gaza would end. 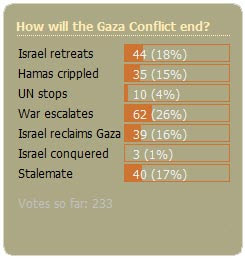 Did the 233 respondents accurately reflect in the graph below the end of the conflict? The answer to that question is very hard to discern. Who actually won and what was actually accomplished has left the whole world scratching their heads over these questions. Did the United Nations put a stop to the conflict? Ten (4%) of the respondents polled believed this would be the outcome. While this clearly didn't happen, the United Nation's pressure did force Israel to expedite their maneuvers before a U.N. censure was enacted or peace keeping troops were inserted. So, in a way, the U.N. did help bring the conflict to an end. Would the war escalate, bringing in other nations into the foray? Sixty-two (28%) believed this would be the outcome. A number of Bible prophecy students especially were keeping a keen eye out for this outcome, looking to see if a Psalm 83 subjugation of Israel's neighbors was in the making. At least for this Gaza Conflict, escalation didn't occur. Would Israel reclaim Gaza? Israel evacuated its settlers and abandoned millions of dollars of agricultural bounty in the attempts at gaining peace for trading land. What Israel gained instead was rockets lobbed daily at them from their former farms and villages. Israel clearly did not take Gaza back (what's left of it after the Palestinians razed the greenhouses upon taking the lease). Surprisingly, Israel didn't even leave a contingent in Gaza as 39 (16%) guessed the outcome would be. Would Hamas conquer Israel? Three (1%) of the respondents saw this scenario. Thank you, our Muslim friends, for your usual grasp on reality! Did Israel retreat as 44 (18%) of the respondents believed would happen? You bet right! The current leadership of Israel surprised the whole world by producing a backbone and making the incursion into Gaza, but extracted it again by retreating from the battlefield and implementing a unilateral ceasefire, coincidently (?) timed with Obama's inauguration. It is this retreat by Israel that is the center of confusion over whether the operation really ended in a stalemate as 40 (17%) believed would happen, and if Israel had actually accomplished their objective in crippling Hamas as 35 (15%) believed would happen. A stalemate would mean both sides laid down their arms because victory was impossible for each. And yet, amidst the rubble of a supposed 1,300 Palestinians killed, 5,500 injured and 4,000 buildings destroyed throughout the Gaza Strip, Hamas leader Khalil al-Hayeh declared "We say proudly that Gaza has won the war, the resistance has won the war, and Hamas has won the war" (reported in The Jerusalem Post in Jan. 30, 2009). To prove they're still in the battle, after the ceasefire Hamas remote detonated a road-side bomb and lobbed a few more missiles into Israel. They are now awaiting the newest shipment of arms from Iran to be released by Egyptian Suez Canal authorities so they can rearm and attack again. If this was a stalemate, then nobody told Hamas, so clearly this scenario didn't play out. And, has Israel achieved their objectives? With only 13 Israelis reported killed in the conflict, their leadership seems to think so. Hamas' tunnel networks and rocket supply have been reduced considerably. But, in reality, Israel has only temporarily achieved their objectives. Hamas still has an iron control, abusing their fellow Palestinians like hostages. Aid pours into the country for rebuilding like never before, but Hamas intercepts it and uses the supplies and funds to rearm. 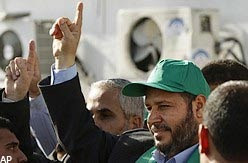 In the Muslim world, the scrappy little resistance against the "Zionist regime" has won Hamas great honor. In the free world, though muffled comments did arise that Israel had the right to protect itself, the largest voice in the world led by U.N. Secretary General Ban-Ki Moon, shouted that Israel was the evil aggressor. By the end of the conflict, Israel lost the public relations war, a war Hamas is an expert at winning. And so, how did the Gaza Conflict end? At this point, nobody can be sure it really has ended. But, if the pullout by Israel on January 19, 2009, is the deciding date of the end of the conflict, then it is over. By all appearances, Israel is the short-term winner, but the long-term loser, for Israel will have to fight this war again. i'm not sure as to the timing of the psalm 83/damascus war, whether its before or after the rapture since both events seem to be right around the corner(i hope). If the psalm 83 battle comes 1st then i can hardly wait to see the lamestream medias and the united nothings' (the u.n.) response. They will be sooooo ticked. It will be hilarious to see isreal thumb their nose in their faces. Well, the Bible does say Jesus is coming like a thief in the night as far as the world is concerned but not as far as Christians are concerned. We will know the season of His return, though not the exact timing. Therefore, we could speculate the descruction of Damacus could be followed by the Rapture followed by the Russian invasion. Of course no one knows for sure how this will play out but hopefully the Lord's return is soon. the rapture could happen any time from before psalm 83 (today would be nice) to DURING the Gog/magog war. By the time Gog/magog is over the rapture seems sure to have taken place cuz EVERYTHING is in place for the tribulation. If i am wrong than PLEASE correct me. My personal thought is this: Hamas or Hezballah precipitate ground war (again), only Netanyahu is in charge this time. At some point Syria and /or Jordan get involved precipitating the destruction of Damascus. At that point Iran, with Russia and others, gets involved, then God gets involved giving the church one last evangelical push, and at some later point the rapture occurs. I only think that because Syria, Lebanon, and Jordan are mysteriously absent from Ezekiel 38-39. And, yeah, "Today would be nice." son of thunder...on another post you apologized for making me upset. Well I was, but that was MY problem, not yours, so the apology comes from me to you. I think it was the abundance and tone of the Obama supporters that got to me. These guys haven't posted on any other entry except the one that mentioned Obama in a negative light. They must Google Obama's name with anything negative then go in and blast the website into submission. I doubt they have any interest in Bible Prophecy like the rest of us. An interesting poll with just as interesting results. I would opine that the majority of respondents (who appear to understand Bible prophecy) seem to have split their votes among the three possible choices which the majority prophetic exegesis about "Last Days' Israel overwhelmingly supports. All three are prophetically correct answers and will be proven to be so when this Gaza Conflict is over. The obvious fact of the matter is that the Gaza Conflict is not over. The IDF still required another 9 weeks to fully complete the destruction of Hamas and its terrorist infrastructure. However, as in Lebanon in 2006, external political pressure from the US and EU caused Israel's current political leadership to rein in its "Dogs of War" (a unilateral cease fire) before the absolutely certain victory over the terrorists could be fully realized. A unilateral cease fire never permanently ended any war, and the IDF's unilateral cease fire is not the end of this one either. All that has occured thus far is a lull in the pace of combat operations. A stable condition resulting in "peace" and an end to the armed conflict, any armed conflict, only occurs when there is a clear and decisive victory. 1. Hamas will have been destroyed, 2. Israel will have reclaimed physical possession of Gaza. At this point these two on-the-ground facts will likely be the precursors to an escalation of regional conflict into the war of Pslam 83/Isaiah 17, which then will, in turn will very probably precipitate the war of Ezekiel 38/39. Bible prophecy provides the indicators of where we are in the sequence of 'Last Days' wars to the "end of the age." And 'Last Days' wars are central to most of the 'Last Days' principle events. What was one of the primary signs Jesus spoke of during His Olivet Discourse? See Matthew 24:3-13. Aside from seeing that false messiahs not lead anyone astray, the primary sign He gave was of "Wars and rumors of wars." Conditions on the ground are being established as precursor events prior to the commencement of Daniel's 70th Week (i.e. the 7-year Tribulation, or two nearly equal periods of 3.5 years/42 months each). Search Bible porphecy and ask yourselves a question. Is there a Temple in Jerusalem during Daniel's 70th Week? (Answer:)Yes, no doubt about it, the Temple exists by at least the 42nd month. Okay, then look at Pslam 83 and Isaiah 17. Is there any mention of a Temple or of Temple worship in Jerusalem? No, there is not. But the war described is a quick war that results in an overwhelming Israeli victory. And what of Ezekiel 38/39? No, no Temple or Temple worship evident here either. And again, the result of this war is again an overwhelming Israeli victory. Obviously these wars are fought prior to the commencement of Daniel's 70th Week. And what do we see coming about in Ezeliel 40? Back to the present. In the 'here and now' we are faced with an imminent resumption of the conflict in Gaza, and an unstable, unresolved military condition to the north with Hezbollah in Lebanon. From this point forward the conditions on the ground will be set which will allow for the rebuilding of the Temple on the Mount (Moriah). as far as psalm 83 and Gog/magog being fought BEFORE the 70th week again i totally agree. However it is possible (i think likely) that Gog/magog will take place AFTER the rapture but BEFORE the 70th week. I like your insights, SeanOsborne, in using the Temple to point out timing. we wouldn't want to do that now. In your opinion who is the BEST scholar and what are the best one or two books on the issue? I read joel rosenbergs' book and mark hitchcoks' book. Both are good scholars but not detailed enough. Who would you say is the most thorough? you recomended the name a few weeks ago to me but i couldnt find him. I looked at all the Barnes&Nobles. I spose i'll have to go to a bible bookstore. I'm looking forward to the next months poll. I cant wait to be proven right. Just kidding. . .or am i? Dr. Rhodes' resources can be found at his ministry site Reasoning From the Scriptures. Book's on this page. Hey, Billy, you don't need to apologize, I understand completely. I get a little hot-headed myself sometimes and I've been in the same situation. A LOT. And hart_thizzle, I could be wrong myself. Guess we'll find out soon enough. I BELIEVE EVERYTHING BREAKS LOOSE BECAUSE OF THE RAPTURE. I SAY THIS BECAUSE I THINK IT IS BEING HELD BACK BY THE HOLY SPIRIT. AFTER THE RAPTURE WITH THE HOLY SPIRIT GONE AND THE DEVASTATION THAT THE U.S. WOULD SUFFER BECAUSE OF THE RAPTURE THERE REALLY WOULD BE NOTHING TO STOP THIS SCENERIO FROM HAPPENING. SO WE MUST BE GOING HOME VERY SOON. oh i hope so. People keep saying the rapture will cause the destruction of the U.S. Isnt that true of the other nations as well? There is a good chance we will lose our world power status before the rapture. If obama- type politics continue to reign and the government continues this massive power grab like what is happening today i.e. stimulus package. we could be easily tranform into an average power socialist country. On gaza, the israelis just flexed their muscles again. we could have many more of these conflicts before the tribulation. border fighting and disputes could go on for years. i see this as a constant. what is not constant is the increasing dirty bomb threat to israel from one of these radical islamic countries. what kind of a person is goerge mitchell? Who is he and what is his role? Is he good or is he a joke? he is the ex US senator from maine who brokered the peace deals in northern ireland. obama appointed him to assist with middle east. very level headed negotiator but very liberal too. i hope he knows what he's doing. It seems our only hope is the rapture.